The Portuguese superstar surpassed himself with a breathtaking overhead hit from inside the box to help put holders Real Madrid closer to the semi-finals. 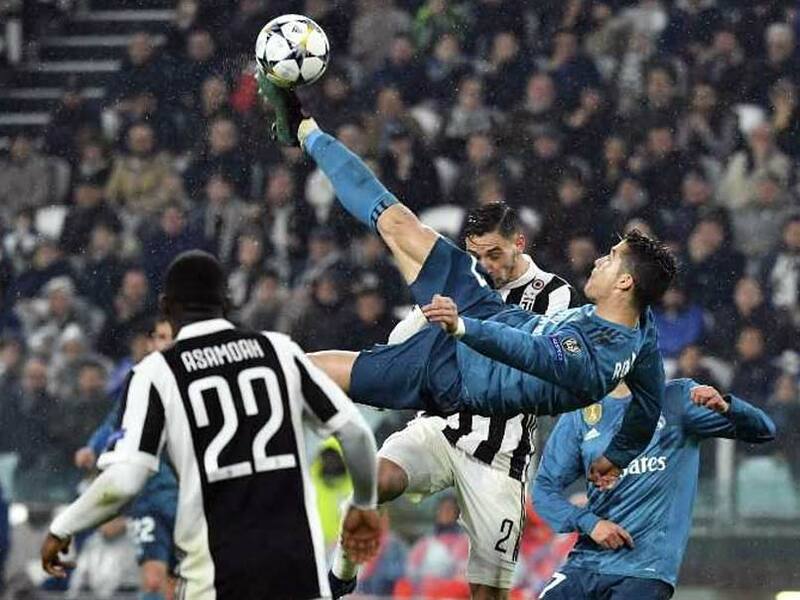 Cristiano Ronaldo scored a record-breaking goal and a stunning overhead bicycle kick to bury Juventus 3-0 on Tuesday in a rematch of last year's Champions League final. 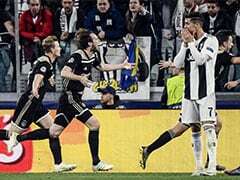 Ronaldo became the first player to score in 10 consecutive Champions League games after just as Real Madrid beat Juventus 3-0 in the first leg of the quarter-finals in Turin, but it was his second goal that everybody will remember. The Portuguese superstar surpassed himself with a breathtaking overhead hit from inside the box to help put holders Real Madrid closer to the semi-finals. "One of the most beautiful goals in the history of football," said Real Madrid coach Zinedine Zidane. It took him only two minutes and 47 seconds to open the scoring in Turin, flicking in Isco's cross. Ronaldo responded by putting his hand to his heart and giving a slight bow of gratitude to the crowd. "The applause for Cristiano says it all," said Carvajal. "Cristiano does things sometimes that only he can do," said Zidane. "It can be said that it is one of the most beautiful goals in the history of football. "It's maybe not as beautiful as mine in Glasgow," joked Zidane of his goal against Bayer Leverkusen in 2002 that gave Real their ninth Champions League title. "I'm the coach but I'm also a football fan, when I see something like that ... that's why Ronaldo is different from others because he can do that kind of thing. "I'm happy for him and happy to have him on our team." Ronaldo has been on a goalscoring streak of 19 goals in his last nine games for Real -- 28 in 2018 -- a feat which even Zidane has said makes him jealous. He has now scored 16 goals in his past 10 Champions League games -- 14 goals this season and a double in last year's final against Juventus. 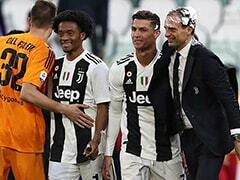 "The Juventus fans applauded Ronaldo but also for his team," said Zidane. "It's beautiful. You don't see that everywhere." "I don't know if Ronaldo's goal is the best in football history, but it's really an extraordinary goal, you can only congratulate him on what he's doing at present," said Allegri. 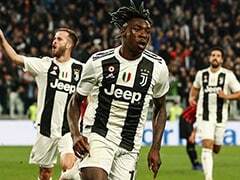 "The applause is a beautiful lesson from the Juventus fans to the whole world, football is a show, when you have 22 or 30 high level players and you see a shot like this one it's good to applaud." "We saw what Ronaldo is and always has been - a player of an extraordinary level who along with Leo Messi is achieving the greatest heights," said Buffon. "This means they can be compared to Maradona and Pele for the way they ultimately are able to decide matches and trophies won by their teams." "When you play against one of the best players in the world, like Cristiano Ronaldo, you need perfection, if you leave space he punishes you, and then he invented a goal that will remain in history. It's a pity that he did it to us," lamented defender Andrea Barzagli. Not only was the world of football talking about Ronaldo's goal, NBA star Lebron James published a photo on Instagram of the action and world MotoGP champion Marc Marquez, a Barcelona fan, tweeted: "Bufff what a great goal for CR7!!!". "Cristiano Ronaldo can now leave the Earth and start playing against the Martians, he has done everything here!" tweeted the Real Madrid defender Alvaro Arbeloa. "Seen a lot of great goals in my time but that is absolutely breathtaking from Ronaldo," said former England player Gary Lineker. "The opposing fans in the stadium applauding the great @cristiano after the bicycle kick and rightly so. Keeps on upping the ante - relentless!" tweeted Rio Ferdinand. There was also humour from English footballer Peter Crouch, who once scored a similar goal for Liverpool, who wrote on Twitter: "There is only a few of us who can do that."